Hot Air Balloons are made with quality weather resistant polyester. 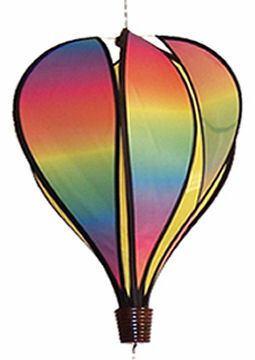 The Balloon measures 16" x 12" with a 26" Curlie tail attached, these colorful printed panels are supported by fiberglass rods which help maintain their shape. Plastic backs the fabric, helping the panels stay rigid. Heavy duty swivels attach the spinner tail and the hook for your balloon. They ship flat but are easy to assemble with included directions. These Hot Air Balloons are made with quality weather resistant polyester. The Balloon measures 16" x 12" with a 26" attached Curly tail. The Kinetic Collection Hot Air Balloons feature detailed dye sublimated printed graphics on all 6 panels. Different graphics on each panel gives the illusion of movement as the balloon spins. The panels are backed with plastic and supported by fiberglass rods to maintain the balloon shape. Heavy duty swivels attach the spinner tail and the hook for hanging. Balloons ship flat and are easy to assemble with included directions. The Mini Hot Air Balloon is made with quality weather resistant polyester. The Balloon measures 7" x 11" with a 26" attached Curly tail. 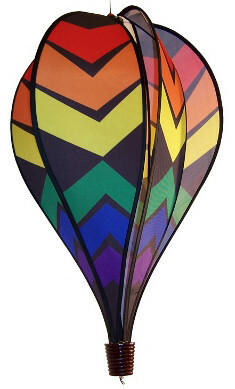 The colorful printed panels are backed with plastic and supported by fiberglass rods to maintain the balloon shape. Heavy duty swivels attach the spinner tail and the hook for hanging. Balloons ship flat and are easy to assemble with included directions. 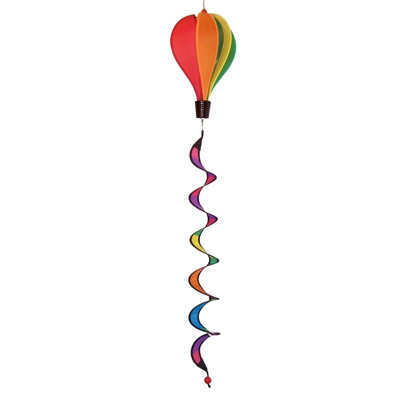 This 10 Panel Hot Air Balloon measures 12" wide by 18" tall and comes with a 26" Curly Tail. This balloon features sparkle fabric that is sure to grab attention. The colorful printed panels are made with quality weather resistant polyester fabric backed with plastic and supported by fiberglass rods to maintain the balloon shape. Heavy duty swivels attach the spinner tail and the hook for hanging. Balloons ship flat and are easy to assemble with included directions. Tail Included. Hot Air Balloons are made with quality weather resistant polyester. The Balloon measures 13" x 21" with no Curly tail. The colorful printed panels are backed with plastic and supported by fiberglass rods to maintain the balloon shape. A heavy duty swivel is included for easy hanging. 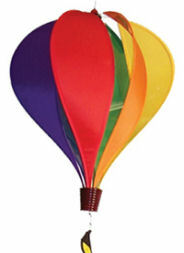 Balloons ship flat and are easy to assemble with included directions.